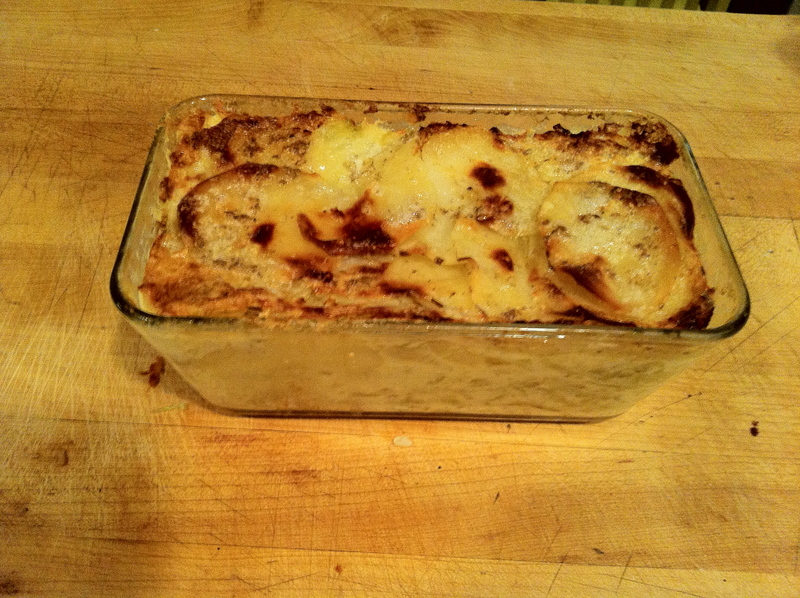 I was sitting at home thinking about these potatoes au gratin that a friend made for me years ago. Soooooooooo, good, and so simple. I’ve never made them. So I did some research, and found a million recipes, all variations on the OG Esscofier version. Usually the American version goes like this, it’s basically Mac n Cheese with potatoes…You make a bechamel sauce, add cheese, layer chedder cheese, sauce and sliced potatoes, with thinly sliced onions on top…I decided to make this dish using the original recipe from Esscofier. Peel, and slice the potatoes. Again I used my Mandolin slicer (they should be 1/8 of an inch thick). Combine the whipped egg, and potatoes. Salt and pepper generously and set aside. Grate the cheese. Now the cheese is key. I went my fave cheese shop “Artisan Cheese Gallery” in Studio City, Cali. I’m tasting cheeses and then I taste this aged gruyere that is like fifty bucks a pound and DAMN, it’s gooooooooooood! I buy a 1/4 pound. Take a baking dish and smear it with a stick of butter. Add a layer of cheese until you get to the top. Sprinkle with extra cheese, and freshly grated nutmeg. Pour the fresh cream in, but do not top off. Leave about a quarter of an inch room at the top. Put it in a pre heated oven at 350 degrees for about an hour and a half. For a perfect crust, you will have to break the crust three times! Once every 20 minutes or so take a wooden spoon and break the crust, and gently swirl and remoisten the potatoes. This will give you the perfect crust. Also, the key to this dish is the cheese. I’ve made it using normal gruyere cheese and it was good, but with the really good aged gruyere it became amazing! *I made this dish using fennel instead of leeks and it was amazing! Afterword: I tried to serve this dish to my 3 1/2 year old daughter. She was not having it! She wanted my Mac n Cheese. I bribed her with a cookie and she took one bite and it was over. She silently ate the whole bowl. I asked her did she like it? And she said “Yeah, could you make this tomorrow daddy? DONE! That looks amazing, although I’m probably going to wait until it cools off a bit before trying it. My biggest complaint about potatoes au gratin is that the bottom is not as yummy as the crusty top. Sounds like your secret tip makes more of the best, crustiest part! Thanks! Nick. P.S. Your secret is safe with me. “She silently ate the whole bowl.” CUTE! I am going to make this, I think it sounds great. It would be helpful to know how many potatoes, leeks, cream etc. you used. I googled for your food blog after hearing about it on Adam Carolla’s podcast. I just got M. Ruhlman’s book on Charcuterie so I may try my hand a curing meats also! I used the Escoffier recipe as a guide. That being said it was very low on exact amounts, and measurements. Really simple. Layer of thinly sliced potatoes, then a layer of sauteed leeks, and grated cheese. (Saute the leeks in unsalted butter). salt, pepper, and freshly grate nutmeg. Coat the potatoes in a well beaten egg. repeat this until the dish is full top with and add the cream, leaving about a half inch space on top. Pop it in the oven. The hard part is dealing with the crispy top as I explained. Thanks for the reply DAG! I used 3 large baking potatoes and 2 big leeks for a 9×9″ glass baking dish. It was the right amount of potatoes but about half as many leeks as I needed. I did the layering thing and it seems to work out well. One mistake I made is I added the potatoes to the whipped egg in a big mixing bowl and proceeded to season with salt and pepper. I think the salt drew out a lot of moisture from the potatoes and the egg seemed very watery when mixed up. So I dumped the water/egg out and then whipped another and added it. Probably too much. It would have been better to do a layer add egg with a brush and then season layer by layer. I did find a 12 month aged swiss gruyere at Trader Joe’s for $9 for 8oz, I have only bought gruyere a couple of times so I can’t compare it to anything, but is was the oldest TJ’s sells. It cooked really well but that last 20 minutes might have been too long, I kept cracking the wonderful crust and the last round it was like the whole thing was a broken sauce. All of the oil from the gruyere (and cream) separated and became a bubbling oil slick. The saucy creamy cheese got all graining and seperated. It tasted great but the final crust look nothing like the previous ones where I had cracked it and mixed it up. Might have been too much egg because of the re-do. Next time I am going to use what I read is a yellow meat potato’s instead of russets. And use more leeks. You have to use horse sense when attempting these recipes. As in: I dumped most of the liquid from the egg bath, also you are right that a lot of the Salt and pepper gets washed off the potatoes so you must them and layer the leeks as you like them. Try it again! You’ve got some excellent-sounding recipes here. Though I tend to make simpler fare, there are a few I must try! Despite the rookie mistake I made with the Mandolin slicer (ouch!! ), these potatoes were delish and I received many compliments…which I, of course, I gave you credit for 🙂 I will definitely be making these again, especially on steak night. Yum…thanks for sharing.